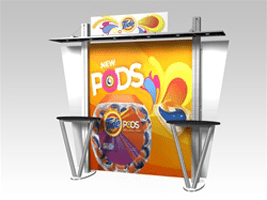 Modular displays are the perfect trade show display units for any company who exhibits at a number of trade shows each year. Trade shows and conventions are a gate way for any business. They provide access to a nationwide and sometimes worldwide market. During just a few days, your company’s products and services have the chance to be exposed to thousands of decision makers from around the world who are influential in your company’s market. Many industries require that you attend several trade shows a year in order to meet with people in different regional markets. Some company’s even have a division that is solely dedicated to running the company’s trade show booth and meeting with clients and several conventions every year. 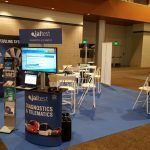 No two convention centers are the same and chances are your booth placement and maybe even the size of your convention or trade show booth will be different at every event. 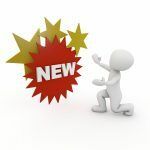 The flexibility to easily change the position of any of the elements in your modular display is just one of the main attributes that make it the perfect choice for a regular convention exhibitor. For example, if you are lucky enough to register for a corner booth the layout of your display will be completely different than if you are in a middle booth or along the back wall of a convention space. Also, different conventions have different rules and regulations about how high in the air a display can reach. 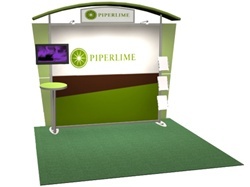 A modular display will lend your staff the flexibility to adjust your booth and optimize your spaces effectiveness. Traveling from show to show can be costly. A modular display is both durable and easy to transport. The materials used to create most modular displays are high quality and very light so they can be easily packed and transported. Also, because modular units can be disassembled and the pieces packed and shipped separately, modular displays make it easier to avoid excess shipping charges for overweight packages. The look of a modular display can be easily customized to fit you company’s style. The color options available for modular displays make it easy to work with images and branding you have already developed for your trade show exhibit. If your product is rapidly changing you may want to keep your booths color scheme neutral and add custom signage to your booth with free standing signage. If you have well established brand and your imaging is not likely to change, it is easy to customize your modular displays with a company logo or other art work.